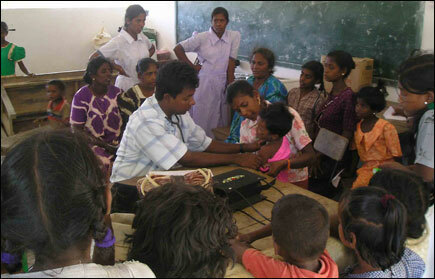 Centre for Health Care (CHC) mobile medical team, on Saturday and Sunday conducted emergency medical clinics for the recent internally displaced civilians at the Punnaineeravi Mahavidyalayam and Udayarkaddu Mahavidyalayam, in Kilinochchi said health care workers. The treated 291 residents fled their homes in Palai, Pooneryn, and Vadamarachchi East when Sri Lankan Army (SLA) fired rockets hit their villages, and are presently accommodated in temporary shelters and in schools, said CHC team members. CHC has decided to extend this service to all internally displaced persons on a daily basis, said CHC authorities.